List Your Homemade VW Specialty Tools Here!!!!!!!! For making seal drivers etc I take the seal transfer the size to MDF board (high density chip board) cut it out with the scroll saw. If I need a stronger one I epoxy or screw a couple together. Works well can be drilled, sanded,screwed etc as need be, and it only leaves a bit of sawdust if things don't go rite. no need for other timing tools, other than dial? With this home-made thing, do you then only need a dial indicator to set the timing, or is another piece of hardware required? ad wrote: I bought an adapter to use a dial indicator for setting injection pump timing, only to find that the threaded rod that was included was the wrong diameter, and also the threaded end did not fit my dial indicator. My solution was to use a brass rod, a roll pin, and a short machine screw of the proper thread. All available from the local hardware store, costing about $1. Just press the roll pin onto the brass rod, cut the head off the screw, and press the screw into the other end of the roll pin. Use pliers to hold. Press the cut end of the screw into the roll pin so the clean threads are exposed. If anyone else has a similiar problem, this is a quick and cheap solution. "C" clamp removal tool. Zelenda wants $64.00 for three pieces of flat steel. What was that saying Barnum said? Here is a tip for the same function tool, no need for the tabs, a bolt or flat steel will do, of the correct length, instructions of use listed. Since the link doesen't work I figured it out myself and it works like a charm. Just make sure you put the nuts up or down so you can reach them easiest to loosen them off. Thanks for posting the trany tools I've wondered how I could get those races out. Here's a coupla pics of my crank sprocket holder for easy removal and torqueing of the crank sprocket bolt. Homemade Valve Spring Compression Tool link. Story of how his gasser hit 600,000 miles. I made a couple of tools for IP disassembly/assembly. And I welded 2 old pump wheels to my workbench. One for a 17mm main axle and one for the 20mm. From the next tool I have to make some pictures. I made a valve remove tool from a glueclamp. This is a lot easier than te tools I saw so far. I welded a piece of pipe on it and made a hole in it to take out the half moons with pliers. Brit101 wrote: "C" clamp removal tool. Zelenda wants $64.00 for three pieces of flat steel. What was that saying Barnum said? Unfortunately you figured it out incorrectly, an "A" for effort none the less. To expand the clamp for insertion of the piece to keep the clamp expanded push the downpipe to one side and the clamp will be expanded on the opposite side. Insert u-bolt, flat steel, bolt to hold c-clamp open. Push downpipe to opposite side, remove c-clamp with "thing" in it that keeps it expanded. Place another "thing" in the expanded c-clamp on the opposite side and push the downpipe to the side of the c-clamp and it will be easy to remove the expanded c-clamp. There is no need to turn the nuts on the u-bolt. I used the muffler clamp the same way as cubevandude, for the same reason as he, & it worked really good. I posted this in another thread but I suppose it could be posted here too. I found this much easier than a muffler clamp. There is a much easier way than an exhaust clamp. I tilt the exhaust way to one side and put one C clamp on by hand. Then I take the other C clamp to the vise and clamp it in. I pry it so that it spreads apart and then put a rod or bolt in place similar to the exhaust clamp idea, it must be long enough but not too long. 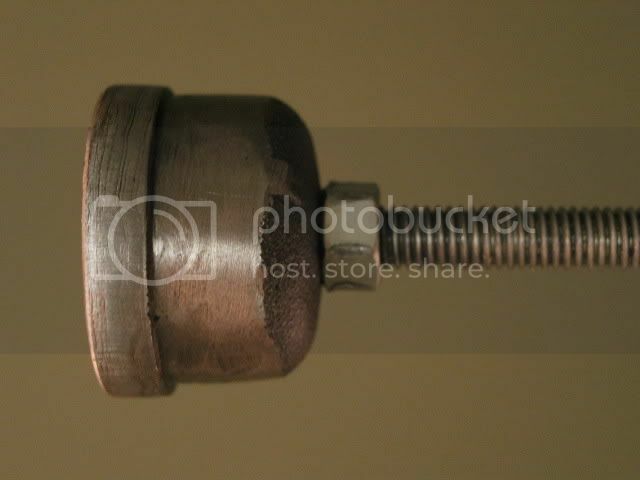 I use the heat shield bolt with the nut juuust started backwards on the end. It can now by put on by hand, once it is in place, tap out the bolt from inside the C clamp and it snaps tight. Its really a piece of cake job once you figure it out. Drive Axle Flange Seal DIY/Homemade tool. Here is my home made valve seat grinder that uses a Dremel and small stones. If you know somebody with a small lathe you can easely make this. I made a guide that fits tight in a new reamed valve guide and use this to resurface the seat, make sure that you weld the nut at a 45 degree angle. I have some other cutters to narrow the seat to the right width. Here are my two Intermediate shaft installation and removal tools. I had them made up by a machinist friend of mine. The larger diameter needs to be slightly less than the outside of the bearing and the smaller diameter portion needs to be slightly smaller than the inside of the bearing. There needs to be two as the bearings are different sizes. The all thread threads into the center part of the tool and is long enough to extend out of the block. A piece of flat with a hole in it along with another 3 nuts on the end of the shaft are used. 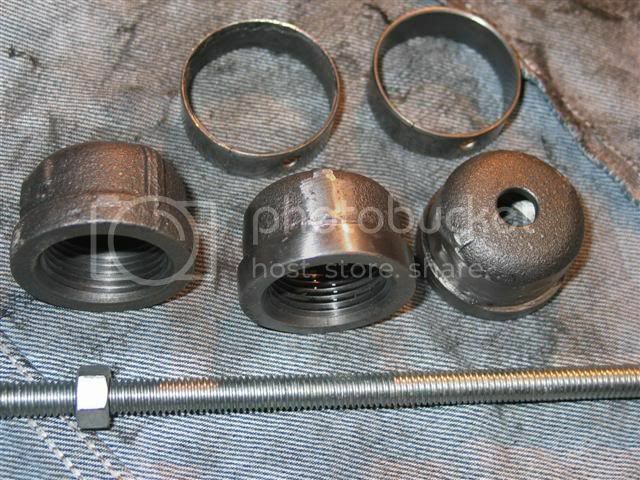 Two of the three nuts are just locked together on the all thread and used to hold the all thread from turning. The other nut is turned against the plate with the hole it it to pull the tool and the bearings out and in. 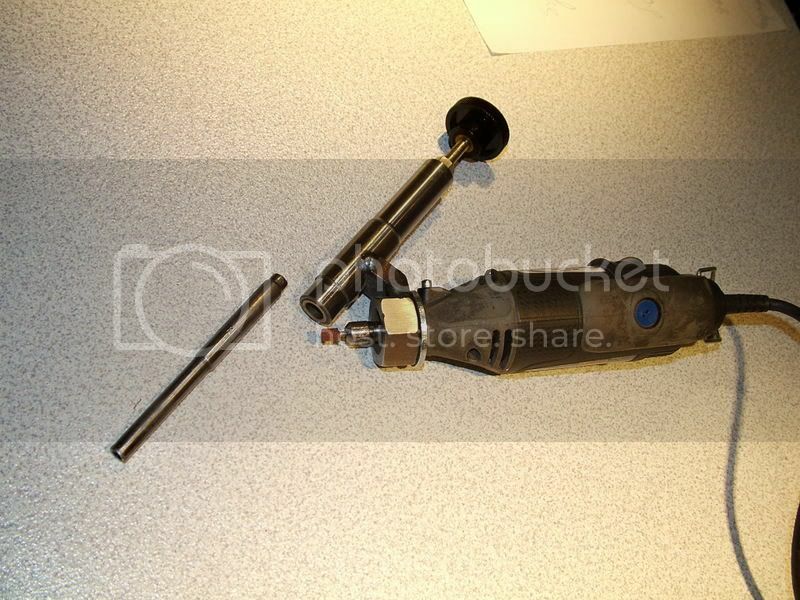 The tool can be used to remove and replace the bearings at the same time. I've been jealous of Andrew's intermediate shaft bearing removal/installation tools since I saw his pictures of them; I had an engine completely dissassembled with the bearings removed, but no good way to re-install the new ones. I don't have a machinist friend, so I took my micrometer and started hunting for something that I could modify using my limited tools and skills. Here's what I found: a 1 inch black pipe cap works great after just a bit of careful grinding. It has a body diameter that is almost exactly the inside diameter of the larger bearing; the cap even has a flange at the end that's a slightly larger diameter. First thread a short piece of 1" pipe in the end; it works well as a handle while grinding/sanding the cap. (I used a high speed right angle grinder with a new grinding disc so I could get sharp, square edges at the inside corner where the diameter steps up.) 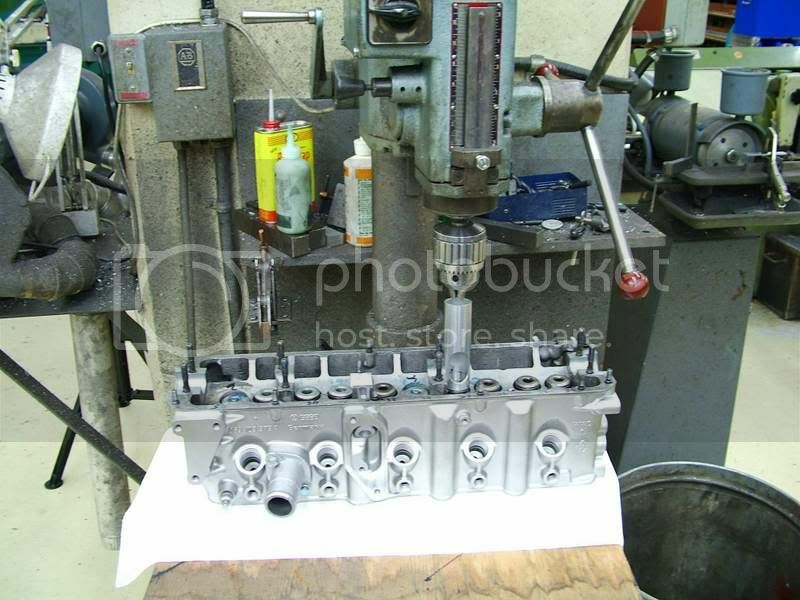 Then grind the casting marks off of the body of the cap so the bearing slides over it easily, and carefully grind down the diameter of the flange so it is smaller than the inside diameter of the machined bearing surface in the block, then drill a hole in the end of it for the threaded rod. It takes a bit more grinding to make the one for the smaller bearing, but it's the same process, and for $6 and about an hour or less you'll have the tools you need to remove and install both the intermediate shaft bearings. Last edited by tawney on Tue Dec 04, 2007 10:17 pm, edited 1 time in total.